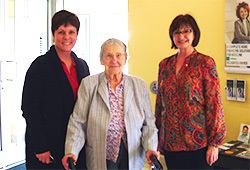 Caisse populaire Welland is proud to cooperate with the diverse needs of all its members, including Mrs. Germaine Chabot, the first 100-year-old member to visit the Caisse located at 637 Niagara Street in Welland. Mrs. Chabot decided to take the leap and visit the Caisse on Niagara St. She found it very nice and welcoming. As a loyal member, she will return to continue benefiting from the services of the employees who have served her so well for so many years on Empire Street. Do as Mrs. Chabot has done and come discover the benefits of combining the two Welland branches.